In today’s world, the most wonderful thing is perhaps a fast internet connection which acts seamlessly and at lightning speed. Everyone wishes for such a miracle. We all know how much frustrating a slow internet connection could be! It brings not only disappointment but also headaches and severe mood swings. (Finding it as an exaggeration? Well, watch out for your own tantrums the next time you experience a snail speed internet connection) Nothing is more annoying than a slow internet connection. It seems to be a curse. We now have a parallel existence in the virtual world along with the real. A fast internet connection in the virtual world is what we call a pollution free pure oxygen in its real counterpart. A superfast connection is, practically, the need of the hour. We have wished for, prayed hard, in numerous occasions for it; while browsing through important study materials, while downloading the latest movie from torrent or when we are driving fast to reach the destination in a furious game. The needs might differ, but, the demand remains the same- a really fast internet connection. It is said miracles still happen and wishes sometimes are indeed fulfilled. Airtel 4G is here to bowl you over with its amazing speed. I couldn’t believe my eyes when I saw the result of the #Airtel4GSpeedTest. It was like a dream come true. Just have a look at the infographic and I’m sure that will make your eyes popping out. 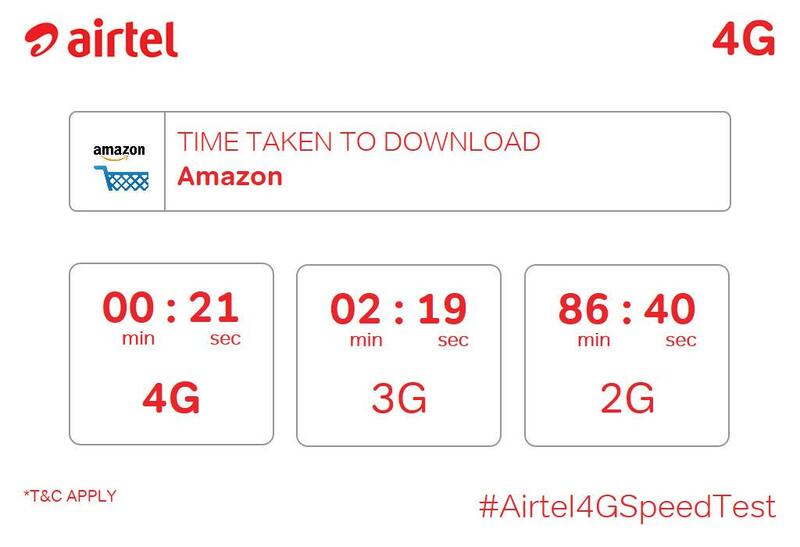 While it takes only 19 seconds to download the Amazon app by using Airtel 4G, it takes 2 minutes and 19 seconds for the person using the mythically ‘fast’ 3G connection. What a waste of time and energy! All you need is a smartphone which supports 4G connectivity. You can hold the world at your fingertips with #Airtel4G. You can take the same test with any of your desired apps on Twitter. I’m pretty sure that the result will take you off your rocker.All you need is to make a query on Twitter addressing Airtel India. Please follow the correct format as shown below to get the result withing the blink of an eye. I’m really impressed by the result and I recommend it for all those who need a faster internet connection. Get, set, go….! That’s a very detailed review Maniparna. I do like the speed they are offering but I wonder if their connectivity has improved and they offer it at all places at the same speed. True..the ‘shake shake’ feature of Airtel app is quite innovative… 🙂 Thanks, Vishal.. I tweeted them yesterday and was amazed with the quick response and results of test! Same here… 😀 It was real fast!